Have you ever wondered....Who are the longest currently tenured coaches at a BCS Conference school that haven't guided their program to a BCS bowl game? Well, I'm glad you asked. 1. Tom O'Brien - Just missed the top position on the list. He joined Boston College in 1997, but he moved to NCSU this year. 2. Glen Mason - Was hired at Minnesota in 1997. However, he got fired last month thereby eliminating him from the list. 3. Jim Leavitt - USF coach since 1996. However, USF has only been a BCS school for 2 years. 4. Randy Edsall - UConn coach since 1999. However, UConn has only been a BCS school since 2004. In the "Camel Club" of folks who've "gone without" the longest, you've got Phil Fulmer standing head and shoulders above the competition. The Vols haven't been to a BCS game since their trip to the Fiesta Bowl following the 1999 season. No other active coach has tasted the thrill of BCS success followed by a longer dry spell than Fulmer. So the question is...how long is "long enough" to wait for your head coach to deliver a BCS Bowl bid? Update: Consider that 35 different BCS schools have made BCS appearances since 1998. There are only 65 schools in BCS conferences. Of the list above only Clemson has any kind of history of being a top football program. Vandy? What have they ever done. Cal? They had not been anything for decades before Telford. Kansas? Gale Sayers was probably the last time they were any good. Tech? They do have a MNC to their credit. Missouri? Have they ever been any good? Rutgers? Schiano deserves so much credit. UVA? Again not a lot of football tradition there. Texas Tech? I cannot remember them being anything before Leach arrived. Arkansas? Some history in the old SWC, but that was long, long ago. Of all those schools I would say the only ones that ever should even think about a BCS bowl are Clemson (weak ACC), Cal (got robbed of a Rose Bowl bid a couple of years ago remember?) and Rutgers (looks like they might be around for a while--good recruiting again). By my fast and rough math, 36 of 60 different BCS schools have made BCS Bowls since 1998 + Boise and Utah. I'll put Clemson, Arkansas, Virginia and Georgia Tech's tradition up against almost any of those schools that have made a BCS visit. Particularly over a 5 year period BEFORE their BCS visit. Note: I went back and update the post with the list of teams that have made BCS appearances. It's actually 35 of 65 + ND, Utah and Boise. For some reason, I thought Nutt had been hired more recently than 1998. No surprise (to me) that Tommy Bowden's not gone BCS bowling. Gary Pinkel is a BAD coach, and Missouri just extended his contract after he started 5-0. Naturally, the Tigers disappointed after that. How long does Clemson keep Bowden? Look at his record- it's not that great. He has been a constant underachiever and basically wins 1-2 games a year that saves his job. With FSU and Miami down this year, he blew a great opportunity to make that a marquee program in the ACC, instead isn't the constant "Runner Up" or "Honorable Mention". skidawg1985 - Tech has far more history of being a top football program than Clemson. And yes, Gailey needs to get it done soon or move on. Being on a list with Gary Pinkel isn't a good thing. As a Vol fan, I coulod care less about the streak b/t BCS bowl appearances. It the lack of SEC championship since 1998 that stinks. Honestly, I don't think there is any glory in receiving a BCS at-large berth. LSU was 3rd in their division for goodness sake and "earned" an at-large spot? Hardly. Paul, could you clarify something. What's the criteria for conference inclusion in that chart? I didn't want to list teams twice. Miami hasn't been to a BCS game since they left the Big East. So I listed them there. hobnail - i wasn't calling you a douche. lol. Sure, Ga Tech had some great tradition in the WWII era, but they don't have a better tradition than Clemson in the modern era. They also don't have near the support Clemson does. 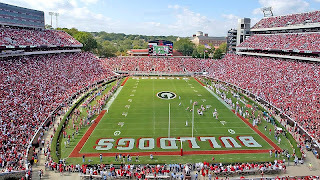 Everyone knows UGA football rules the state of Georgia and GT is an afterthought. Just look at their stadium on gamedays. There's also their academic issues as they have only a few non-engineering majors for football players to choose from as opposed to a Clemson. One name that should have been included was Dan McCarney(sp) from Iowa State. He was there for 12 years and never went to a BCS. He was asked to step down at the end of the past season. Interesting that FSU has the most BCS appearences with 6. Of course, they only won one of those. OSU and USC have the most wins, with four each. I did neglect that Tech has a longer and arguably better tradition than Clemson. Could be something psychological about not wanting to give Tech credit for anything. Would Chuck Amato have made the list had he not been fired? Houston Nutt has the worst and most immoral character of any coach in this country. He has his friends verbally abuse players and then brags about it. As long as he is at Arkansas, there will never be a BCS bid. At least Houston Nutt is number one in something. This guy is a joke. He is void of character and often speaks untruths. He will never coach in a bcs bowl unless he is an assistant somewhere and they keep him away from the players. Annonymous, you have NO CLUE what you are talking about. Do not trash a good man with your garbage and hating spirit. Houston is a fine man with more morals in his pinky than you have in your body, atleast according to your post. Sooooo, lay off Houston when you do not know what you are talking about. In addition, Houston will coach in a BCS this year in 2007/08 with the Heisman candidate Darren McFadden leading the way for him. If you define morals as lies and deceitfulness, Houston Nutt is your man. If only the "Good Christian man" could recruit consistently and maybe give up the play calling he might be worth 1.2 million a year. Why is he texting and calling that attractive local reporter around a thousand times in two months, I guess his wife doesn't mind? I still can't figure out why he went back to fayetteville from the heisman ceremony instead of going to be with his family, who were planning his mother in laws funeral for the next day. Why did he call that reporter and that Hotel that same night before the funeral? I pretty much don't care if you guys run Nutt down b/c he's not my coach. But I can't let you post stuff that will get either of us sued. Keep the criticisms professional or at least provable. Don't post stuff about the guy that will get me sued. Or I'll have to delete it. You need not be worried about any lawsuit (ref: Houston Nutt; defamation claim), as such a claim is next to impossible to prove when dealing with a public figure. It is even more impossible to prove in regard to proximate cause and damages for which a single poster (i.e., statement-maker) when there have been 100,000 or more people who have already made the same or substantially similar posts and/or other verbal and written statements about the man. The bottom line is that a legal claim/case in this context would very literally be impossible to prove. Oh, and did I mention that the truth of any such statement is an affirmative (complete) defense to any such claim.